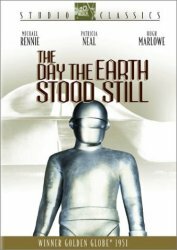 Widely acclaimed as one of the most influential sci-fi films of the 1950s. A spaceship lands in Washington, DC, capturing the attention of the world. But, the alien emissary (Rennie) it brings refuses to reveal his mission to any single government, leaving the military, the politicians, and millions of ordinary people to wait in fear. Soon their distrust turns to calls of violence. But one young woman (Neal) and her son befriend him ... and soon realize that they may be all that stands between the human race and total destruction.